Daphne’s Dive. Photo by Joan Marcus. BOTTOM LINE: A thoughtful ensemble drama about finding home in an unconventional place. 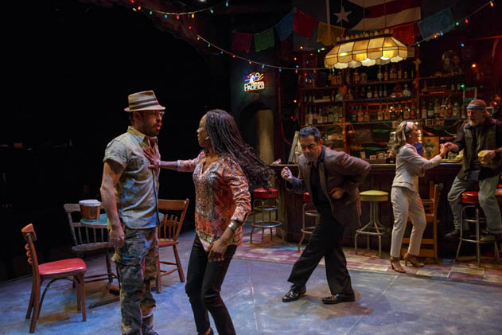 Pulitzer Prize-winning playwright Quiara Alegría Hudes, has penned an intimate play demonstrating how resilience and love can change the hand you’ve been dealt in life. On a small, vibrant corner of North Philly, Daphne’s Dive has just opened for the day, spurred awake by lively piano music from the apartment upstairs. It’s purveyor and namesake Daphne (Vanessa Aspillaga) is no-nonsense with her diverse band of regulars: Pablo (Matt Saldivar), a tortured artist, who composes his paintings with stolen trash from dumpsters around town; Rey (Gordon Joseph Weiss), a longtime biker who labors as a glass cutter and spends his evenings drinking away his wages; and Jenn (KK Moggie), a performance artist who dances daily on the steps of City Hall to protest, donning bold handmade costumes. Rounding out the crew is Inez (Daphne Rubin-Vega), Daphne’s rich, fashionable sister, and her husband, Acosta (Carlos Gomez) a well-dressed businessman looking to make big changes in his neighborhood. This small tribe congregates at Daphne’s Dive to talk politics and money, or to make a trade for a job or a drink. When Pablo discovers a young girl named Ruby (Samira Wiley) near the dumpster behind the bar, they become a makeshift family for her over the course of her life. Not primarily plot driven, the play serves as a platform for the exchange of ideas, touching on deeper issues such as child abuse and addiction, slowly revealing more about each character and furthering along the story. Still, despite the heavy subject matter at times, there are a lot of laughs to balance it out. The friendly atmosphere at Daphne’s harkens back to a time when local bars were open before noon and provided havens for artists and the commerce of conversation, smoothed over by a few drinks. Director Thomas Kail (of Hamilton and In The Heights fame) has woven together a lovely multilayered production that focuses on the significance of community, blended with a signature urban vibe. Betsy Adams’s lighting and Donyale Werle’s scenic design are both very well-executed, lending an appropriately dingy, but warm playing space for the story to unfold within. The costumes, by Toni-Leslie James, utilize mostly everyday streetwear and feature some wonderful standout pieces in Jenn’s striking protest garb and Inez’s sleek ensembles with corresponding wig changes. The ensemble cast are all excellent and highly accomplished actors, but the real heart of the play is in the mother-daughter scenes between Daphne and Ruby. Aspillaga gives a poignant performance as the reserved Daphne, who carves out a big, loving space for Ruby, in both her heart and her life. Wiley is equally compelling as Ruby, capturing the earnest quality of a young girl coming into her own and learning to navigate through loss and self-destruction. While the structure of Daphne’s Dive is a often predictable, it is a compassionate chronicle of the rewards of community and the irreparable damage of falling outside of those "family" norms. Reminding us that while renewal and forgiveness are never easy, both are always within reach. (Daphne’s Dive plays at the The Romulus Linney Courtyard Theatre at Pershing Square Signature Theatre, 480 West 42nd Street, through June 12, 2016. Run time is 1 hour 40 minutes with no intermission. Performances are Tuesdays at 7:30; Wednesdays at 2 and 7:30; Thursdays and Fridays at 7:30; Saturdays at 2 and 8; and Sundays at 2. Tickets are $25 through June 5th, and starting at $30 June 7-12th. Tickets are available at signaturetheatre.org or call 212-244-7529. For more information visit signaturetheatre.org). Daphne’s Dive is written by Quiara Alegría Hudes and directed by Thomas Kail. Scenic Design is by Donyale Werle. Lighting Design is by Betsy Adams. Costume Design is by Toni-Leslie James. Sound Design is by Nevin Steinberg. Music is by Michel Camilo. Production Stage Manager is Lori Ann Zepp. Casting by Telsey & Company. Publicity by Boneau/Bryan-Brown. The cast is Vanessa Aspillaga, Carlos Gomez, KK Moggie, Daphne Rubin-Vega, Matt Saldivar, Gordon Joseph Weiss, Samira Wiley.